Ex Industries offers Intrinsic safety barriers (known also as isolation barriers) from Pepperl+Fuchs. We offer the widest selection of intrinsic safety products for protection of electrical signals located in hazardous areas. We offer both Zener barriers and galvanic isolation barriers. Intrinsic safety (IS) is a technique that protects the operation of electrical equipment in hazardous areas by limiting the energy—electrical and thermal—available for ignition. There are multiple ways to help make equipment safe for use in hazardous, explosive, areas. Intrinsic safety (ATEX and IECEx explosion classifications) is one of the available methods for electrical equipment. We offer the K-System interface technology as well as the Z-System (Zener Barriers) from Pepperl+Fuchs for use in hazardous locations and explosive atmosphere. For protection of electrical signals located in hazardous areas. These intrinsic safety modules uses the energy limiting of Zener Barrier with galvanic isolation. 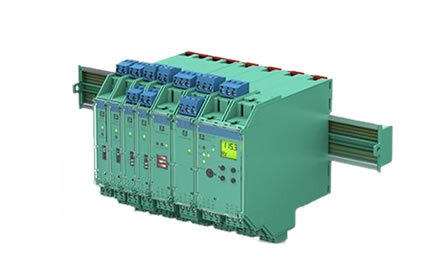 They the flexible DIN rail mounted K-System modules. Our Zener barriers provide cost saving Ex-protection for applications in process automation systems. 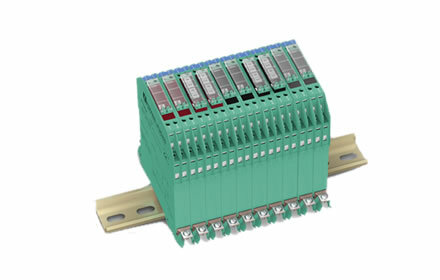 They are fast mounting on DIN-rail, with required grounding directly on the DIN mounting rail. For pricing, ordering and other information, click here.